MPs have warned the NHS is not getting to grips with hospital bugs. They have called for a national surveillance scheme for all infections. Which are the key bugs hitting hospital wards? Methicillin-resistant staphylococcus aureus infections can cause a broad range of symptoms depending on the part of the body that is infected. Infection often results in redness, swelling and tenderness, and can prove resistant to treatment. It has been linked to nearly 1,000 deaths a year. MRSA - which has been dubbed a superbug - is the most infamous of all the hospital-acquired infections, and has dominated the headlines in recent years. During the last general election it became one of the key battlegrounds between the parties. 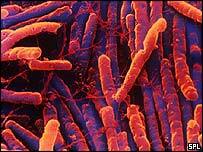 C difficile is a bacterium found in 3% of adults, although it is much more common in the elderly and babies. It is only a problem when certain antibiotics cause an imbalance of the normal bacteria of the gut. Symptoms of infection vary from nothing to diarrhoea, fever, nausea and abdominal pain. Most people make a full recovery after treatment with antibiotics, but occasionally elderly people with other conditions can have a more serious bout which can be life-threatening. Enterococci is a bacterium found in the faeces of many humans and animals. The commonest cause of infections is urinary tract and wound, but it can also affect the bloodstream, heart and brain. The bacterium is among the most antibiotic resistant. Only two expensive and potentially toxic antibiotics can treat the most serious enterococcai infections. Renal dialysis, transplant, haematology and intensive care patients are the most susceptible to infection. Acinbetobacter is a type of bacterium that can be found in may sources in the environment, including drinking water, soil, sewage and food. Infection from most strains is rare, but there are a few, including baumannii, which can cause infection in hospital patients who are already unwell. Such infections can include bloodstream, wound and urinary tract infections, and can become difficult to treat if they become resistant to antibiotics. Although not caused by one specific bacterium, orthopaedic (such as knee and hip) surgical site infections have become so concerning that ministers have ordered the number of cases to be monitored. The results will be published later this year. A surgical site is the incision or cut in the skin made by a surgeon to carry out the operation. An infection can occur when bacteria from the skin - one of the most common is coagulase-negative staphylococci - or other part of the environment, which normally causes no harm, enters the cut and multiplies. This can cause symptoms as the body tries to fight the infection, including pus, inflammation, swelling, pain and fever.